Built to withstand the rigors of a construction environment and is equally useful in design offices. * Steel construction with four ball bearing swivel casters (two lock). * Width adjusts to fit 24" 30" or 36" hanging clamps (clamps not included). * Holds up to 12 clamps that simply drop in and lift out. * Height adjusts to hold drawings up to 48" long. 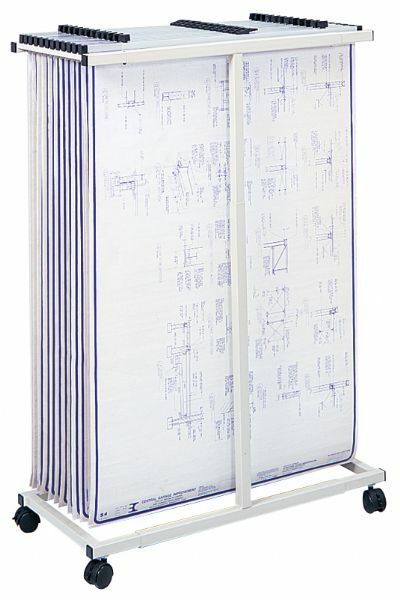 * Stores up to 1200 3-mil sheets or 240 lbs. Easy set up. * 27½" to 39¼"w x 16"d x 40" to 52"h.
Height Range: 40" - 52"
Width Range: 27 1/2" - 39 1/4"
33" x 28" x 3"